PRODOMOWIEN - WE PURSUE A CLEAR LINE. A clear line. Since 1973. Since Peter Teichgräber found prodomoWien in 1973, we at our company are writing the history of design. Our approach has significantly contributed to the design and interior quality becoming understood as a culturally significant aspect. In over 40 years we've built up an expertise in the history of design and today we offer you our passion for furniture and our customer-oriented quality of service. What remains constant is the attitude. 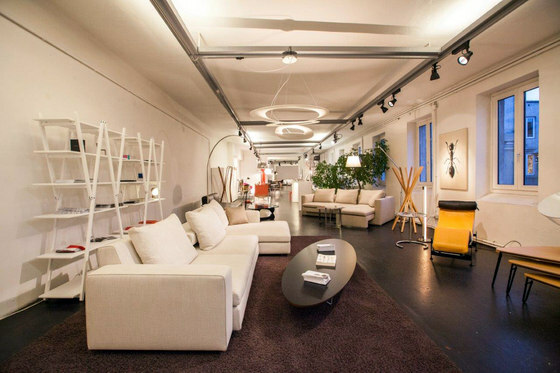 Trademark of prodomoWien was and is the principle of combing through the numerous new developments on the international furniture market, to afterwards present the most noteworthy findings to our customers. Although today the furniture available in our showrooms is somewhat different from that of 40 years ago - our attitude has not changed a thing. Furniture with a story to hear. Not just the products themselves but also the associated culture and the background information are important to us. Therefore, we also know the history behind the pieces of furniture that we offer - be it a simple chair, classic and extravagant upholstery pieces or functional office furniture. 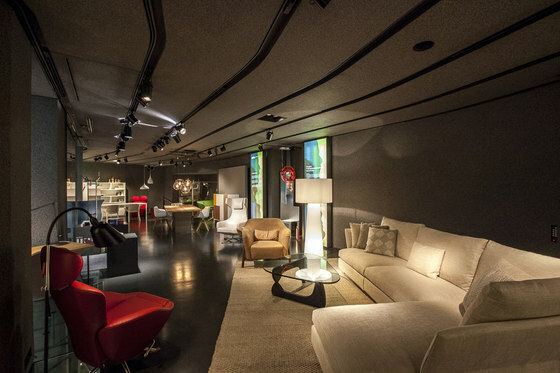 In our showroom you can always find a selection of furniture from our most important partners. PRODOMOWINDOWS - WINDOW TO THE CITY. prodomo gives design a performance stage. In March 2007 prodomo celebrated the opening of its second location: the downtown spot prodomoWindows. From the very beginning its motto has been "We give design a performance stage". This vibrant and distinctive concept is reminiscent of a theatre. The deliberately dimly lit background opens to a viewer a stage designed to create a particular enchanting feel. 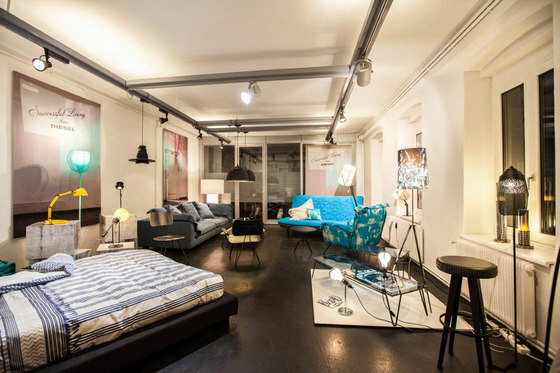 Furniture and accessories, as the star protagonists, offer fascinating stories on the subject of design, screens are the curtain and the people as the audience connect the conceptual shop "Window to the city" with the real life. The hot spot for design culture. prodomoWindows sports a diversified "game plan" which serves to accommodate and demonstrate the variety of prodomoKollektion experiences. At regular time intervals the highlights are staged in the form of sales exhibitions. These are the demonstrations reflecting the joy of extraordinary designs. 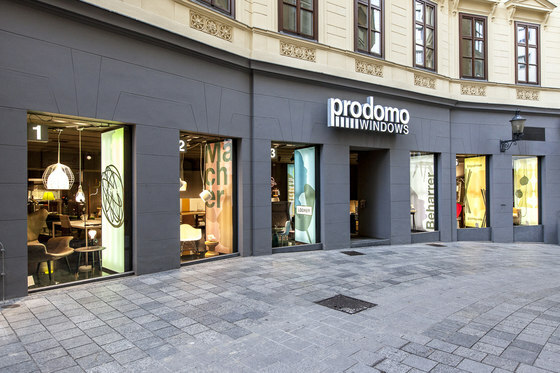 Whether classic design, outdoor plastic furniture, lamps, hand-made pieces or works from young designers: prodomoWindows always puts new themes in the spotlight and thus offers new inspirations. We put protagonists in the spotlight. prodomoWindows puts the spotlight not only on the prominent design names and well-known manufacturers, but also those who have yet to breakthrough. And so, as part of selected events under the motto "Design Connects”, our customers and friends of the house get the possibility to meet and engage in conversation with the real protagonists, to learn the stories behind each design and each product first hand. PRODOMOBESTOF - TOP OF THE CROP. Internet - the today’s final frontier. The range of haute-design furniture has become unmanageably wide. To give you an easy overview of the major products on the market we have launched prodomoBestOf: a carefully picked selection of the most popular pieces of furniture for home and office from the prodomoKollektion. prodomoBestOf is just a click away on the prodomoWebsite. So anytime you are browsing online you can easily get an overview of the most sought after furniture pieces in the prodomoWebshop, which offers an impressive range on the list prices. Furniture is a sensual product. Having a nice sit on it, giving it a good look all over - these are invariably essential buying criteria. 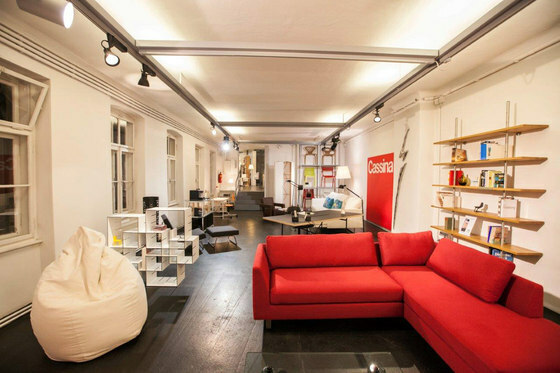 Therefore, it is only logical that prodomo offers much more than just an online store: two well-stocked showrooms in Vienna, competent professional advice from experienced interior designers, planning support and delivery service. Whatever you want to know about your desired furniture: with prodomo you are not facing your questions alone. Frankly speaking: in a Europe without borders, nobody wants to pay for the same product more than is absolutely necessary. Therefore, we constantly monitor the price changes and will be happy to lay out before you the options that individually suit you best. By the way: a key standard for prodomo is that the service does not end with the purchase. It has been a pleasant matter of course for our customers since 1973.